Join the discussion on our forums! Come discuss Living Mana over in our dedicated Living Mana discussion topic. The minions will now read as actual "treants" after patch 12.0.0. This may make the card more playable! In mutch ups versus miracle rogue this card is absolutely MVP! Devolve or Vanish and you are f**ked. Just witnessed a Druid to play this on his first turn, he just casually played Innervate, Innervate, The Coin and Living Mana. And all that for just 1 x Mana Treant. Well, you have to learn somehow, I guess. Can someone explain the 5 mana cost? I can understand that it summons a 2/2 per point of mana, but what's that 5 mana? Minimum mana cost to cast it? If cast on turn 7 for example, do you have 2 mana left over? I can't wrap my head around it. Mana Treant per mana crystal. Turn 5 - 5 Mana Treant. Turn 7 - 7 Mana Treant. urn 9 - 7 Mana Treant (maximum on board) + you save 2 mana. Turn 3 + Innervate + Living Mana = 3 Mana Treant. 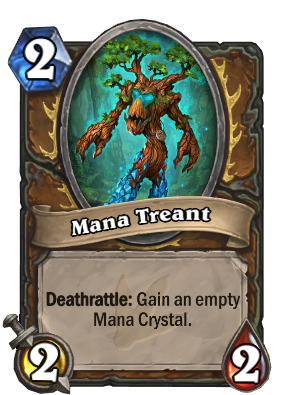 Turn 2 + The Coin + Innervate + Living Mana = 2 Mana Treant. p.s: and you dont need "extra activiation", when you cast Living Mana you lose all 5 mana (this is 5 mana cost spell for sure), so you have 0/5 mana for now. But, now you just consume mana crystals for mana treants and destroy all mana crystals. So now you are 0/1 on mana crystals. (1/1 on next turn). 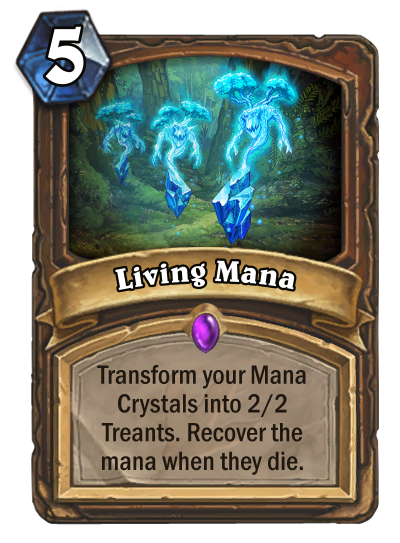 My only gripe is that when mana treants die they give you EMPTY crystals. Oh and to make things worse, it doesn't even work with innervate. The card is fine and It's even a key piece in one of the top 3 decks ATM. Would be so busted if it worked with innervate.